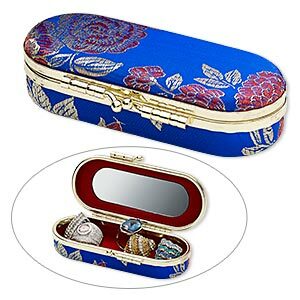 Box, satin brocade / velveteen / glass / gold-finished steel, royal blue and multicolored, 4-1/2 x 2-1/2 inch oval with 3-1/4 x 1-inch mirror and floral design. Sold individually. Item Number: H20-2062PK Have a question about this item? Easy jewelry or cosmetic transport. 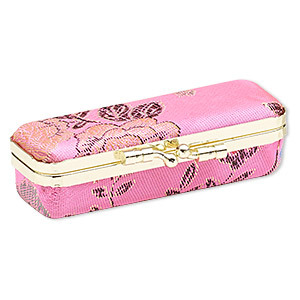 Sturdy metal inside, colorful satin-like brocade on the outside, velvety lining and mirror on the inside. Snap closure and gold-colored detailing. Colors, shapes and sizes may vary in each lot. Gift box, satin / velveteen / gold-finished steel, pink and multicolored, 3-3/4 x 1-1/2 inches with 3 x 1/2 inch mirror. Sold individually. 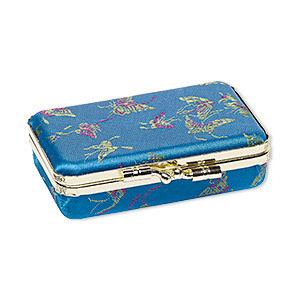 Jewelry box, satin brocade / glass / steel / velveteen, teal, 3-1/2 x 1 x 2-1/4 inch rectangle with butterfly pattern and mirror. Sold individually.